Whilst on holiday in Cornwall a couple of weeks ago we found ourselves in the little town of Boscastle on several occasions. 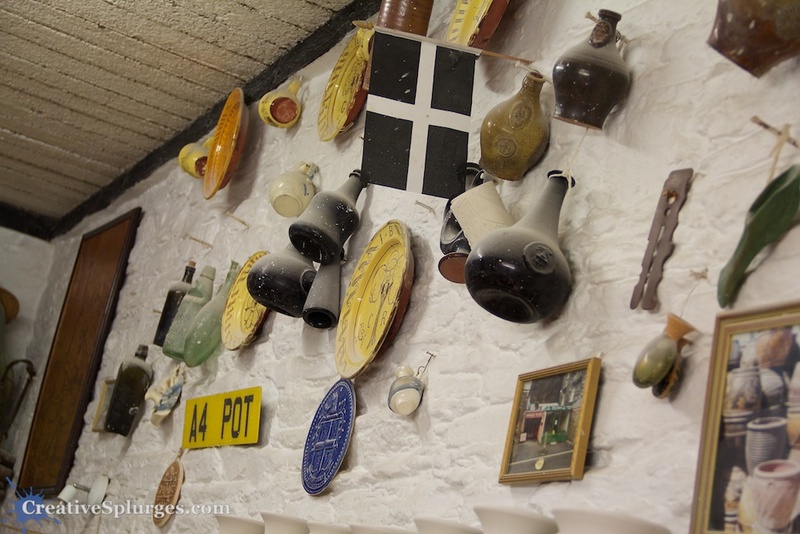 One of the things that kept us returning there was the Boscastle Pottery shop. After our first visit, whence my wife bought herself a rather nice teacup and saucer, I decided I wanted a coffee mug, so we had a second visit. 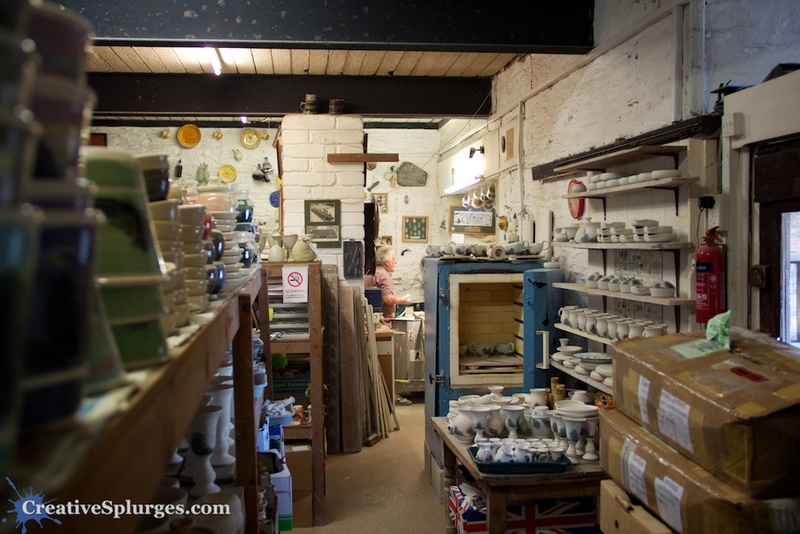 On our third visit, I plucked up the courage to ask if I could take some pictures, and was lucky enough to be allowed into the potter’s workshop to take some photographs. 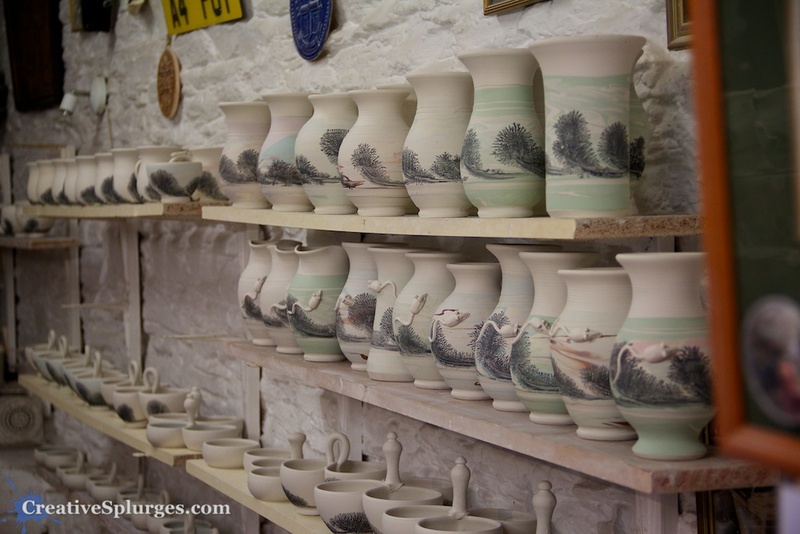 Boscastle Pottery is a family run business. 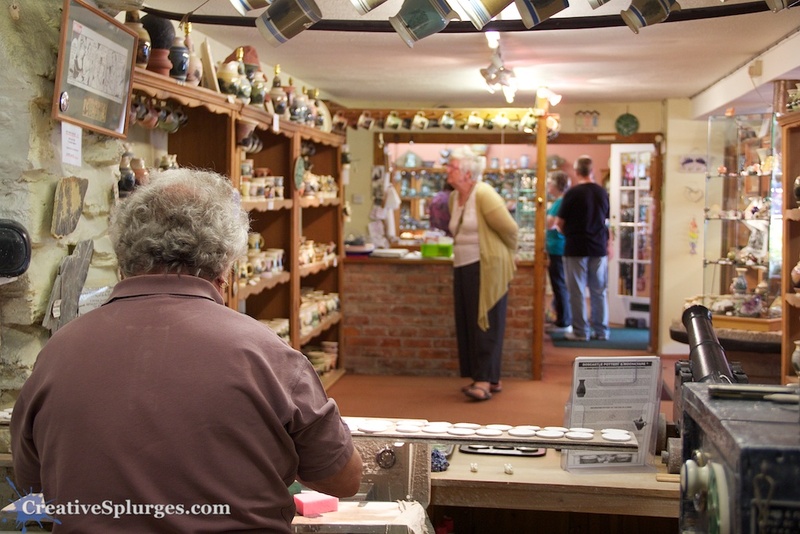 Roger Irving Little, his wife Nannette and son Tim make the pottery and run the shop. 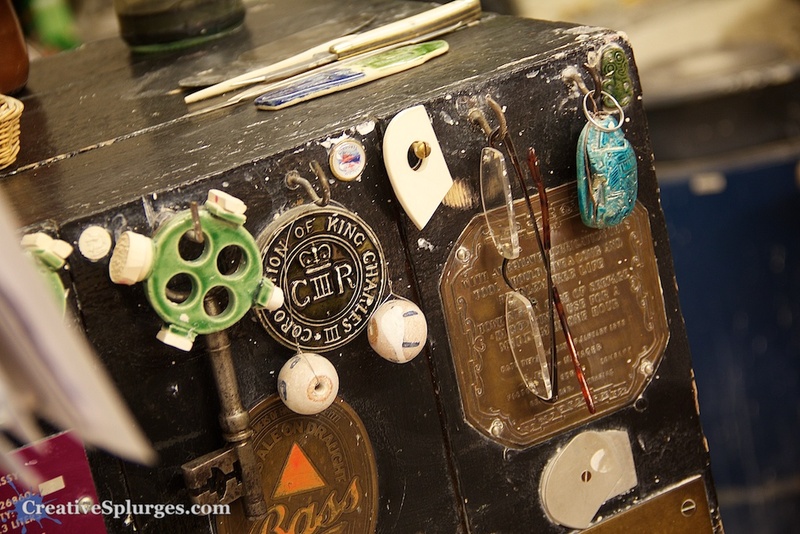 Tim wasn’t there when I visited, but Roger was working away at the wheel on some small fridge magnets. 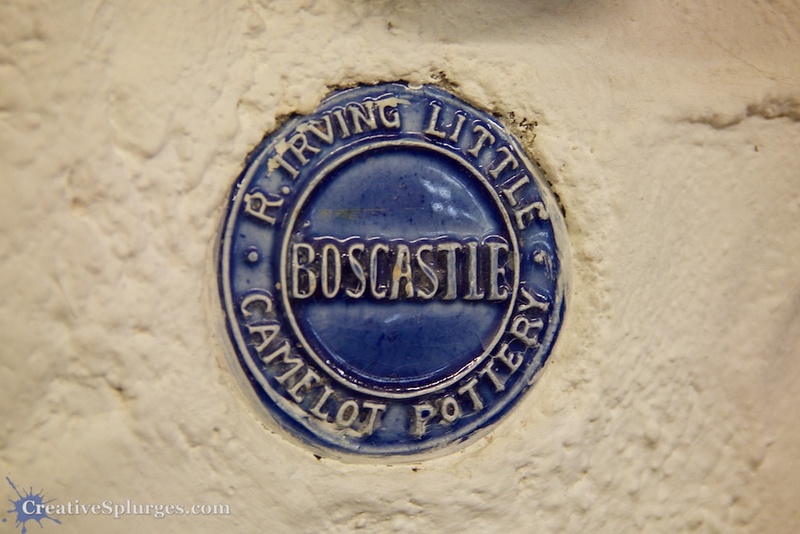 Boscastle Pottery is famous for its Mochaware, which creates intricate patterns on the side of the pot. This is then often painted to create a skyline effect. It was this look that I instantly fell in love with when I walked into the shop for the first time. 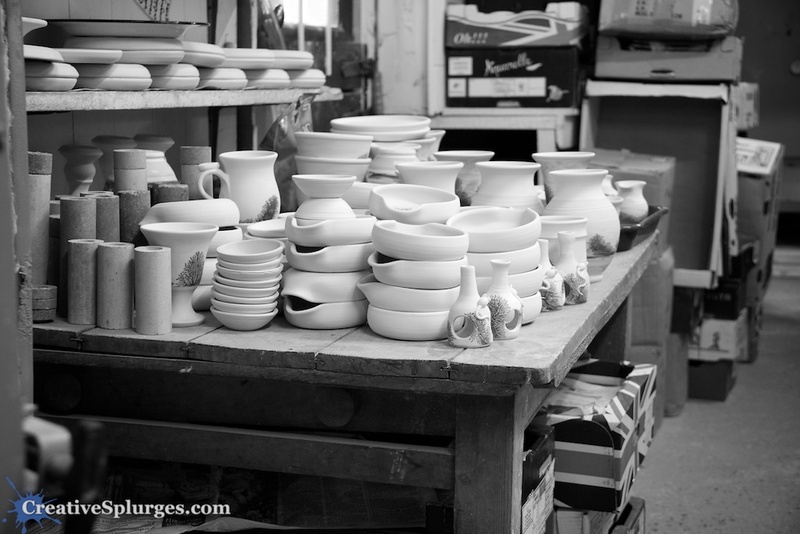 Behind the potter in the image above is his workshop, full of pottery in various stages of completion. 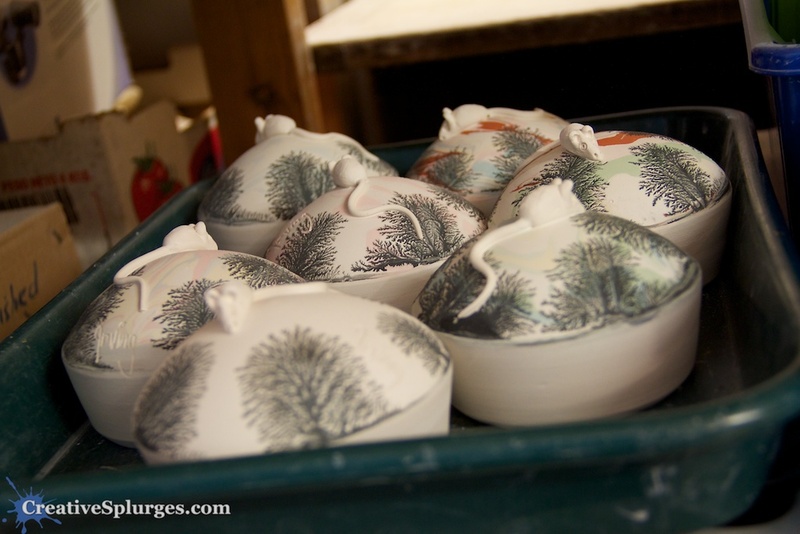 These ones, for instance, were awaiting a second firing. The workshop was brilliant. 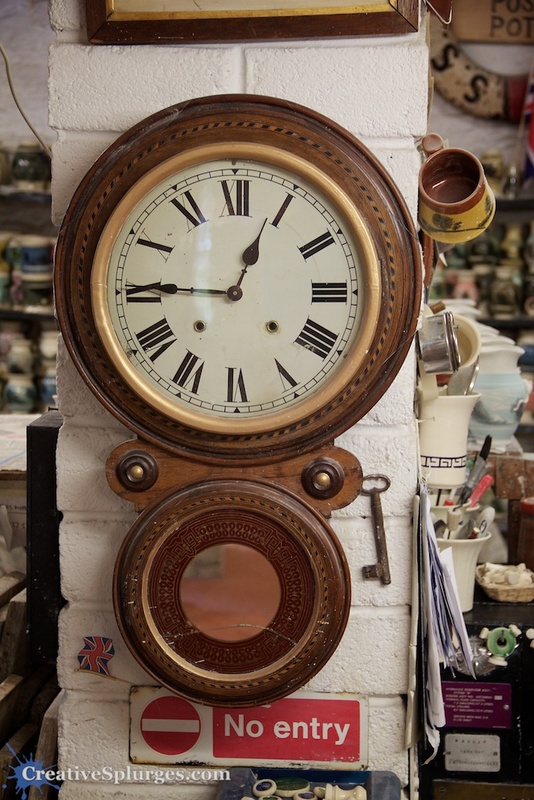 Every flat surface had pottery of some sort on it, there was nice old wooden shelves, and here and there were eclectic items, just because. 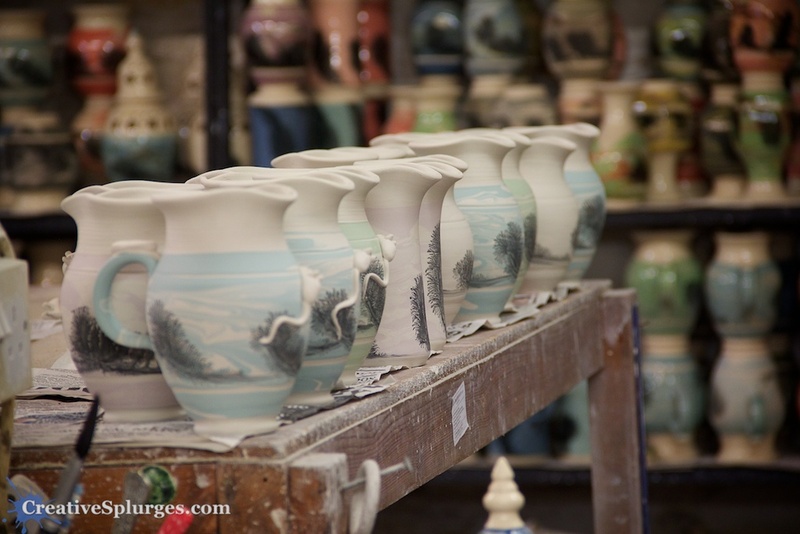 Here, some jugs awaiting a second firing. You can see the Mochaware patterning a bit clearer in that image. 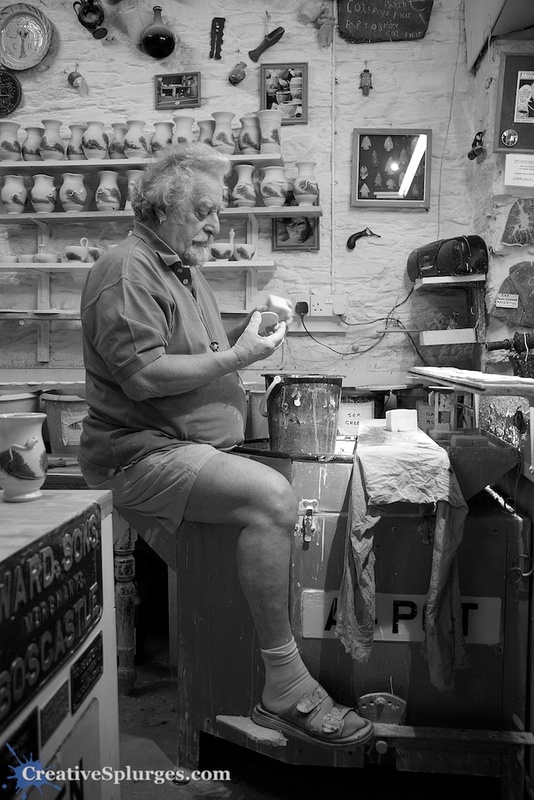 As I like photographing people, I made sure to capture Roger the potter as well as the wonderful surroundings he was working in. I’ve recently changed how I monochrome images a little bit. I used to use the black and white presets in Aperture to remove all of the colour, using (usually) a green, yellow or orange filter to adjust whether different colours would monochrome to black or white. I still use these techniques, but I’ve also started using the high contrast sepia preset as well, and then dialling down the sepia until it’s virtually grey. It leaves, as can be seen in the image above, just a hint of the sepia colour in the image which I like the look of. I’ve also found the higher-contrast sepia process also leaves the tones looking clearer and more appealing compared to the black and white processes (or even just the traditional way of desaturating the image indiscriminately. This is for no technical reason, I just think the end result looks nicer. Of course, I still like to shoot in colour, I just think monochrome is great for bringing out details and textures. Anyway, I digress. As usual. 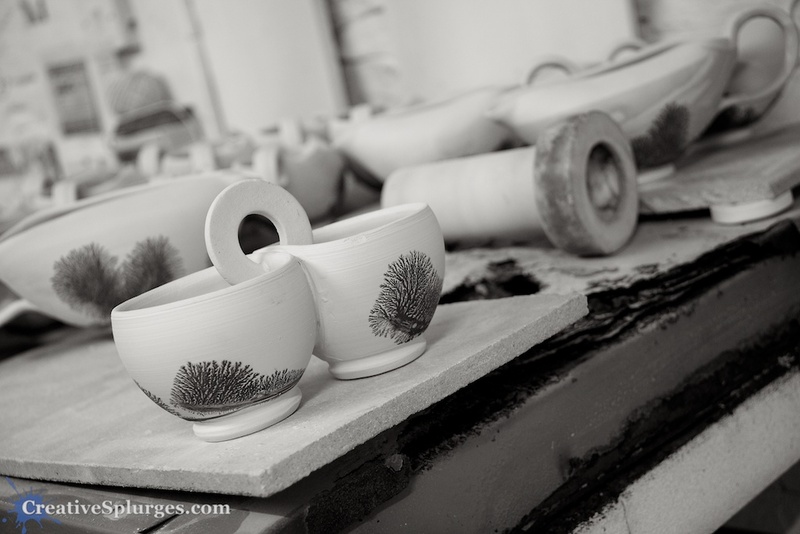 I soon turned back to detailing the workshop, occasionally turning back to photograph the potter from where I’d found myself. This was on the wall next to his wheel. On the opposing wall, above his head, was an amazing collection. 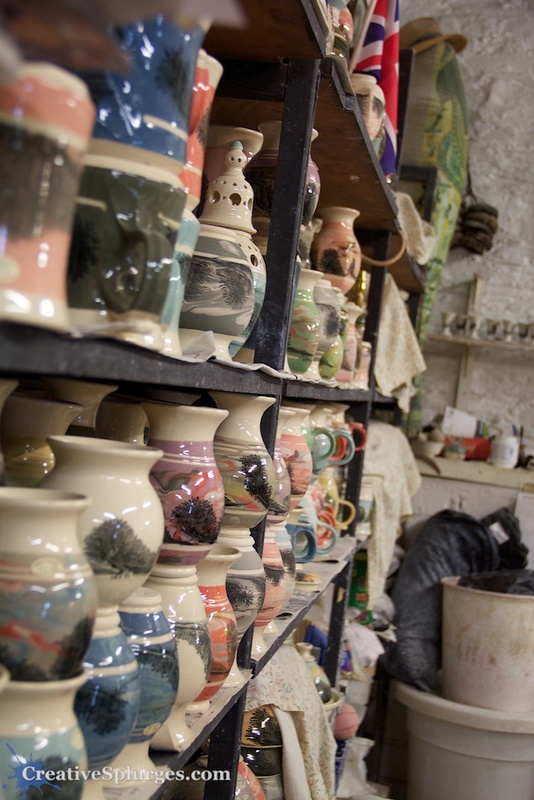 In the other direction, facing deeper into the workshop, was an assortment of pottery in various stages of completion. 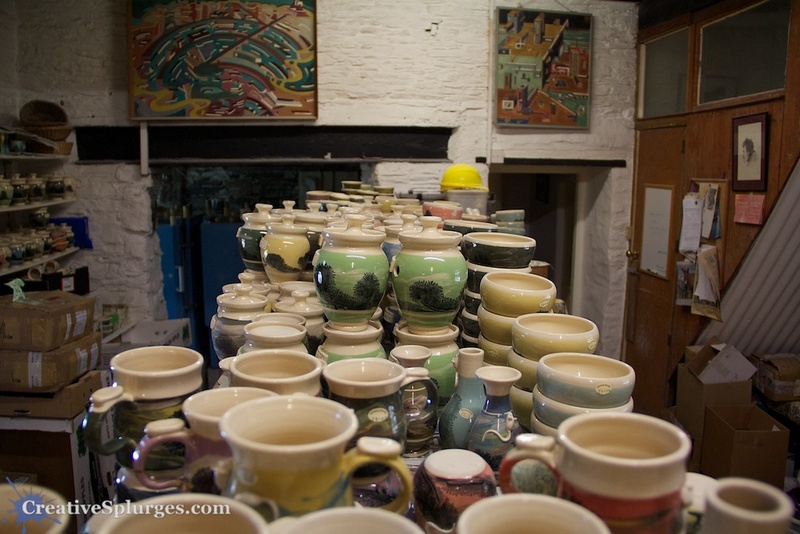 The main thing back there, as you’d expect, was pottery, most of which was waiting for a round in the kilns. 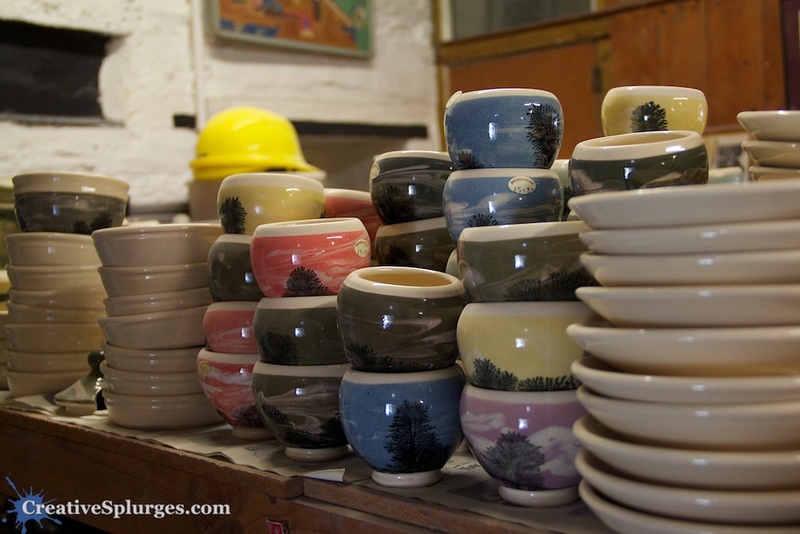 I really liked the non-glossy look of the non-quite-fully-fired pottery. In fact, they also sell posts without the final glaze on, which gives a rougher yet more rustic finish. The coffee mug I bought was in this style. 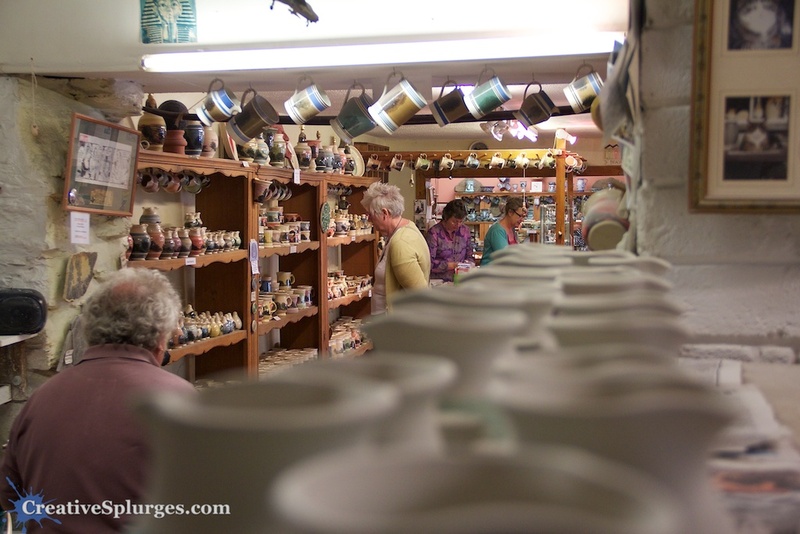 Besides the not-yet ready pottery, there was a whole section given over to completed pottery, presumably just waiting for space in the shop. 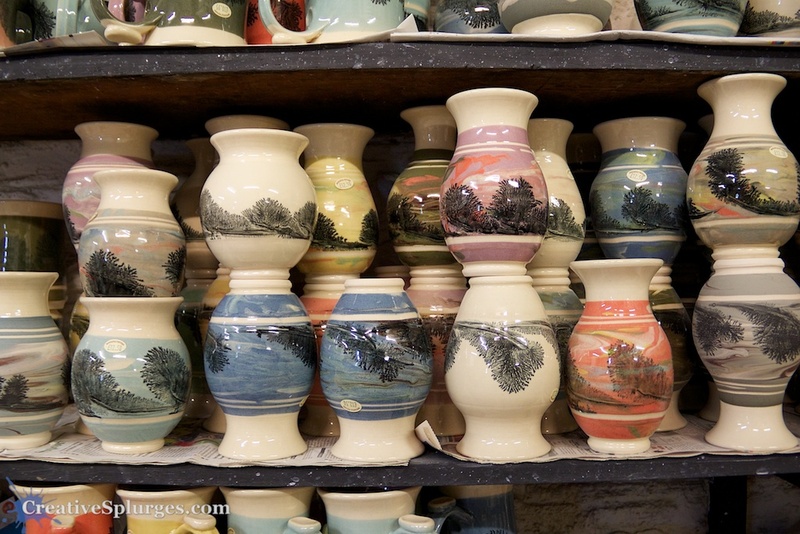 I then briefly turned my attention back to the potter. 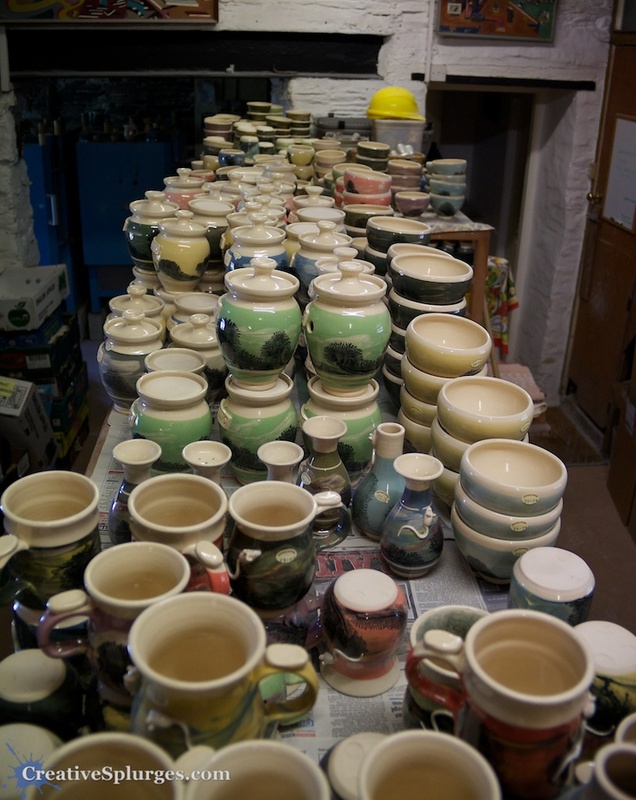 And then back to some of the pottery. 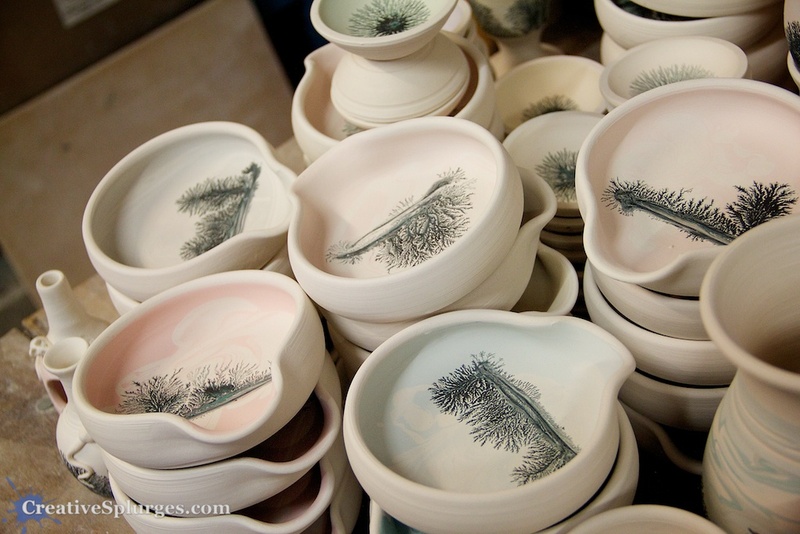 I probably should have looked up some synonyms for pottery before I started writing this post. Oh well. Too late now. After this I returned to paying attention to Roger. This image is a colour version of the shot that opened this post. I definitely prefer the monochrome version. This next image looks fine on small screens, but if you look at the full res version it doesn’t hold up so well. I like it enough to make it worth keeping, however. 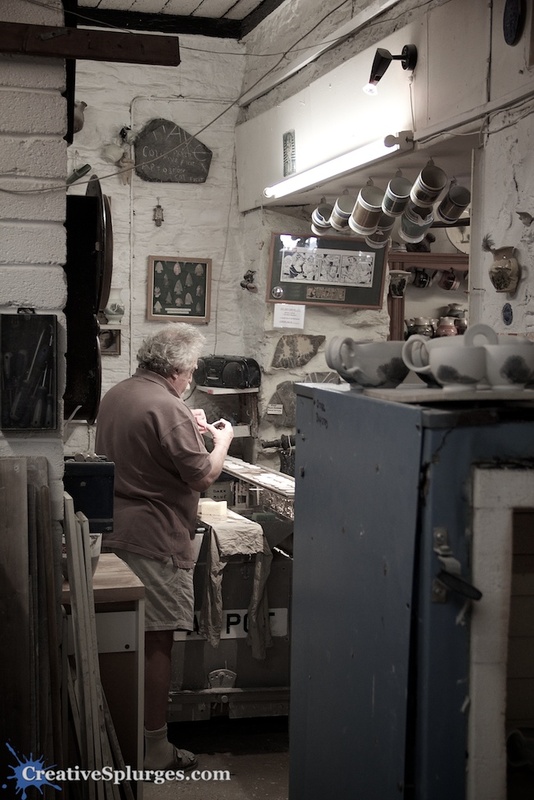 I also tried to capture his view over the shop as he sits and works. 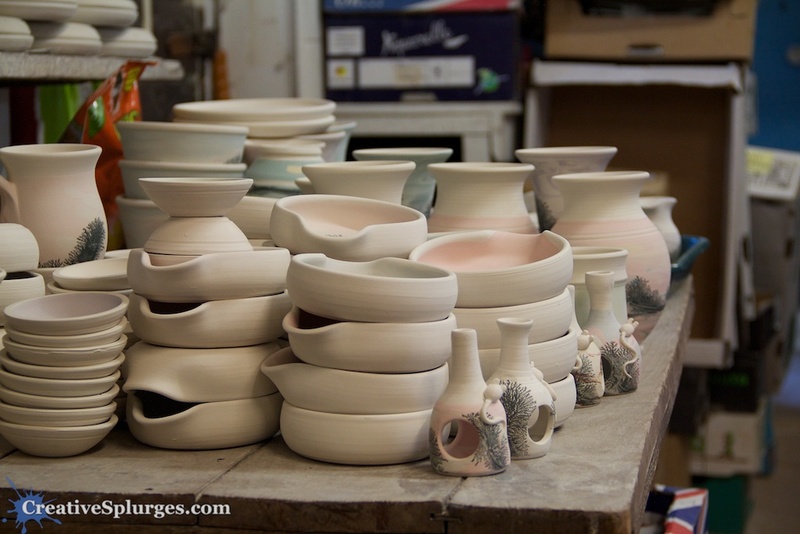 I tried a similar shot over some unfinished pots, but I’m not sure how well it’s worked. 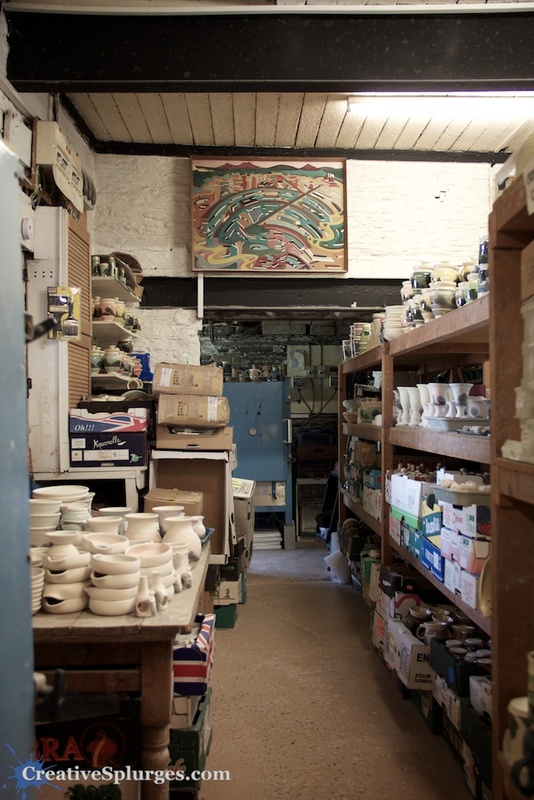 One of my favourite sights was the spot right behind the potter, full of little trinkets. 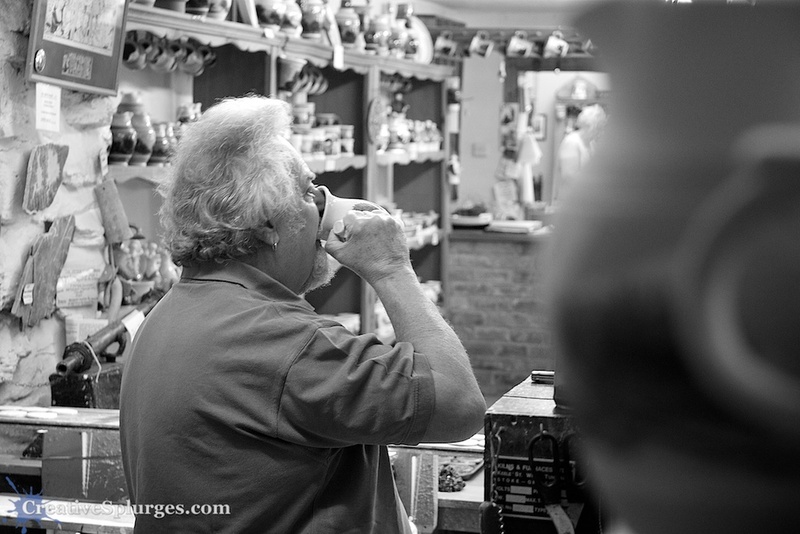 As I closed up my little visit, I started talking to Roger, shooting as I talked. 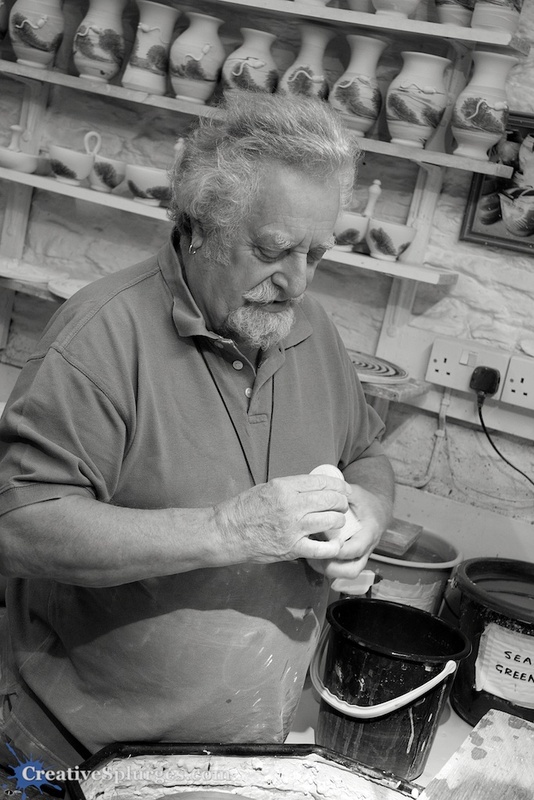 He’s a truly fascinating man; he has an interest in archaeology, but not having the grades to go and learn how to do it for a living he’s ended up doing the next best thing: making pots for future generations to dig up. 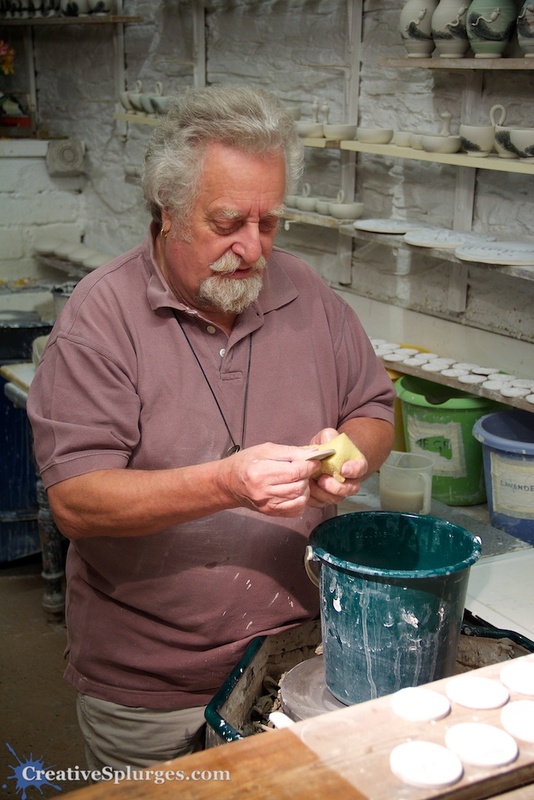 This is why he marks every piece of pottery he makes with his name, location, and the year, so that when some descendant of Sir Tony Robinson digs up a bit of Boscastle Pottery centuries from now, they’ll know where it came from. Which is a brilliant sentiment if you ask me. 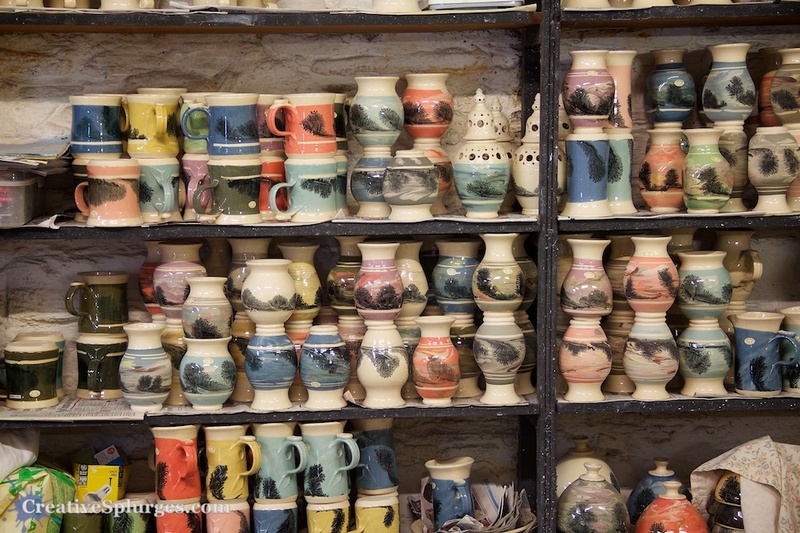 As we finished speaking, I mentioned that I loved this approach of marking all of his pottery, and remarked how I loved one of the pieces on the wall which was basically an example of that year’s signature. 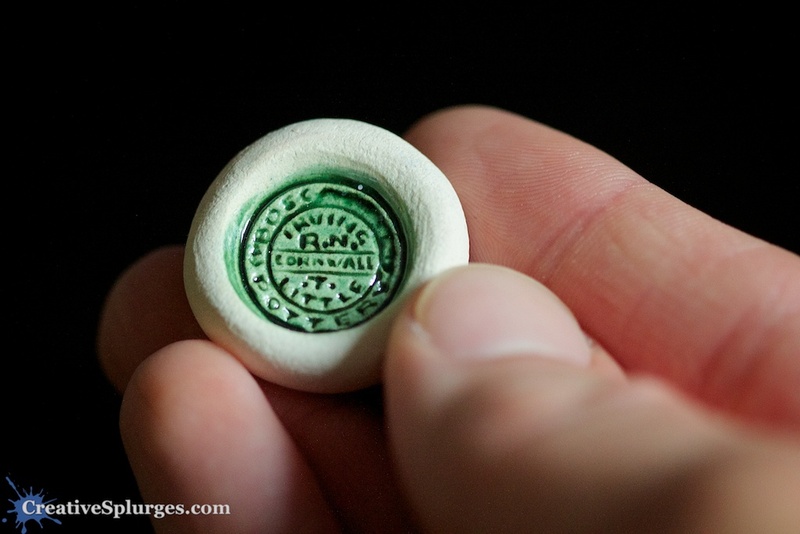 He responded by giving me a tiny piece of pottery containing his potter’s stamp. This is now a prized possession sitting proudly on a shelf in my living room at home. This little shoot was another little step closer to overcoming my timidness when it comes to asking to photograph strangers. 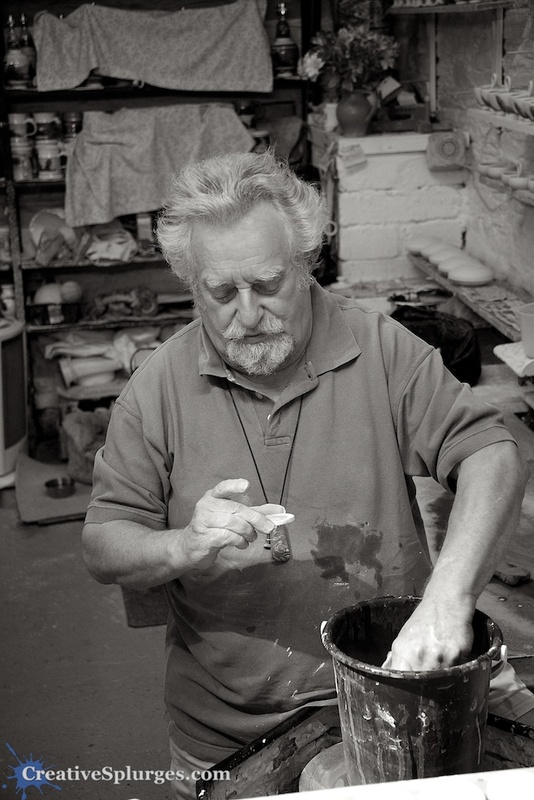 It was a bit by accident that me taking a few photographs of the potter turned into a complete wander around the workshop where the public are not normally allowed to tread, so I do consider myself very lucky and – because of how much I loved the pottery – honoured to be allowed to take these photographs. I’ve of course sent copies of these images to the owners to do with as they please.